They are the most majestic. Almost 2 meters high they have enormous corollas, 7-10 cm large, joint in spectacular inflorescences. They blossom only once a year in spring. 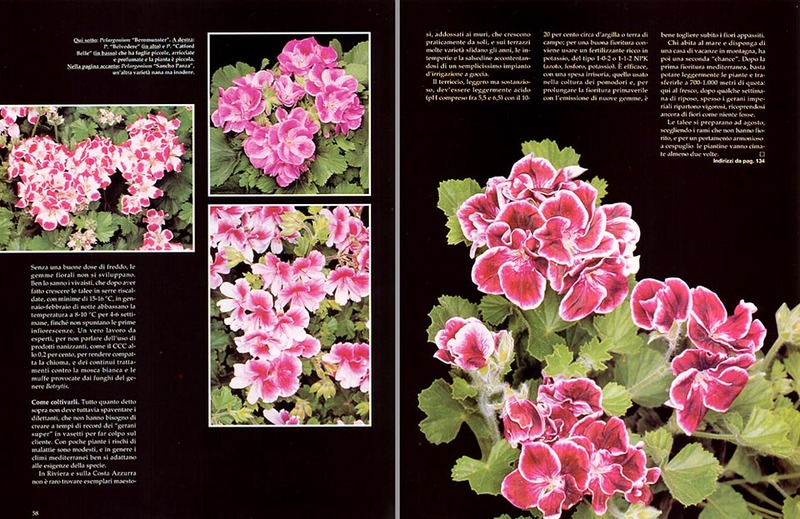 Florists’ Geraniums, Royal Geraniums, Five-spotted Geraniums, Butterfly Geraniums, are all names which summarize the undoubted horticultural qualities of the hybrids once classified as Pelargonium macranthum, and now, more properly, as Pelargonium x domesticum. Essentially, they descend from the Pelargonium cucullatum, introduced in Europe in 1672, by Paul Hermann, a naturalist guest of the Dutch East India Company, who had picked it up by Cape Town, along the slopes of the Table Mountain, where, still now, it forms huge tufts with thick pink-purple inflorescences. 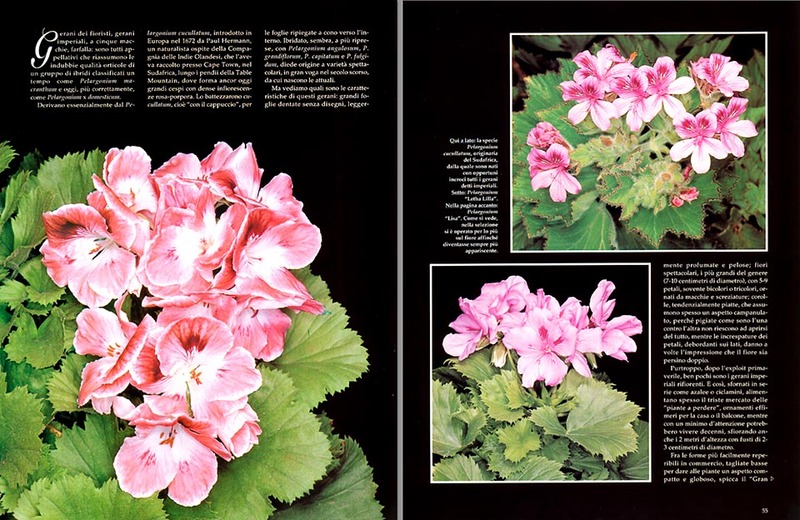 They christened it cucullatum, that is, “with the cowl”, due to the leaves folded like a cone, towards the interior, and hybridized, it seems, several times, with the Pelargonium angulosum, Pelargonium grandiflorum, Pelargonium capitatum and Pelargonium fulgidum, originated spectacular varieties, which were in vogue the last century, from which the present ones were born. Large dentate leaves without drawings, often enormous, slightly perfumed and hairy; and spectacular flowers, the greatest of this kind, with 5-9 petals and 7-10 cm of diameter, frequently bi coloured, or tricoloured, embellished by dots and variegated, feather-shaped, drawings. Mostly flat, they assume often a campanulate appearance, because, as they are pressed one on the other, they cannot open fully; and the wrinkles of the petals, overflowing gaily on the sides, give sometimes the impression of a double corolla. Unluckily, after the spring exploit, very few are the Royal Geraniums which bloom again; and so, mass-produced like azaleas or cyclamens, they feed often the gloomy market of the “not returnable” plants: ephemeral decorations for the house or the balcony, while, with some attention, they might live for decades, approaching even the 2 metres of height, with stems of 2-3 cm of diameter. 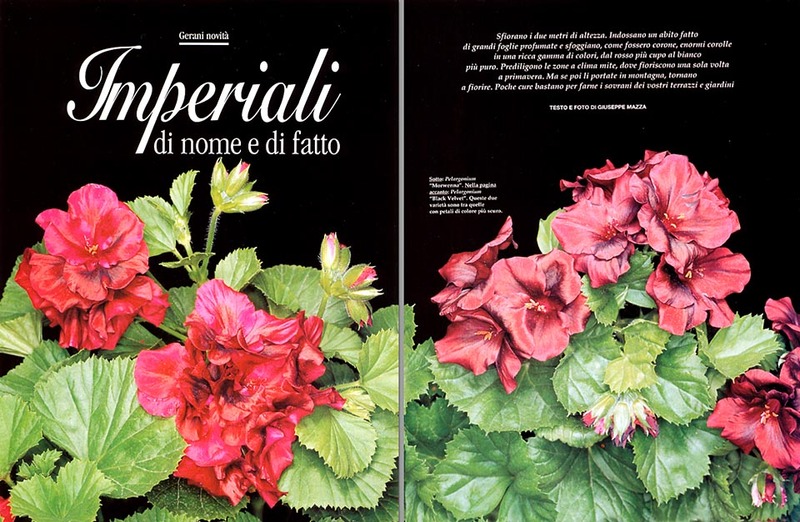 Between the forms most easily available in the market, cut low, to give the plants a compact and globe-shaped appearance, stands out the ‘Gran Slam’, created by Schmidt in 1950, with vermilion petals; the ‘Mikado’, similar, but rose-coloured; ‘Fabiola’, pink, with red dots and striae of various sizes; and ‘Lisa’, with delicate peach-coloured gradations. We are stricken by the perfect white of ‘Virginia’, the dark brown of ‘Morwenna’, the five red dots of ‘Gloriette’, on a slightly rose background; the crazy zones of ‘Eckmann’; the triumph of the pink in the ‘Belvedere’; the odd purple gradation of ‘Letha Lilla’; and the velvet, but tending to the black, corollas of the ‘Black Velvet’. Dark colours, purple, and old looks evoked also by the ‘Pompei’ and the ‘Burgundy’, born in 1946. 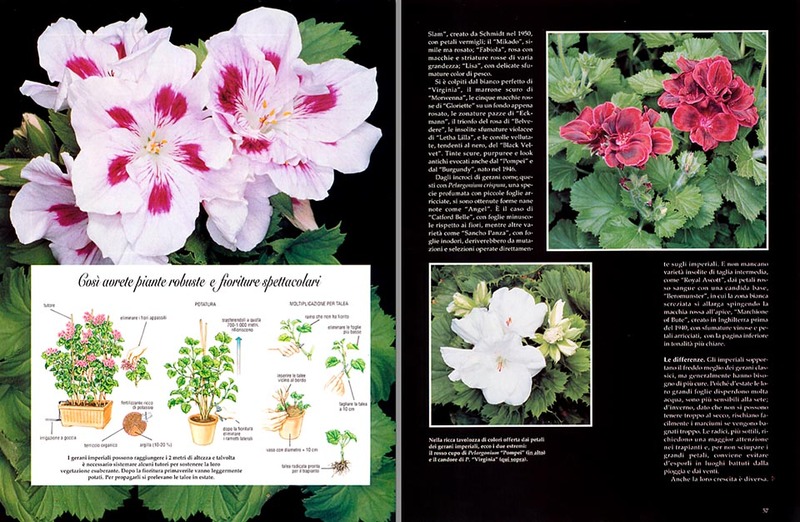 From the cross-breeding of Geraniums like the above with the Pelargonium crispum, a perfumed species with small curled leaves, they have obtained some dwarf forms, known as “Angel”. It is the case of ‘Catford Belle’, with small leaves compared to the flowers; while other dwarf varieties such as ‘Sancho Panza’, with leaves substantially odourless, should come through mutations and selections done directly on the royal. And there are unusual varieties of intermediate size, like the ‘Royal Ascott’, with blood-red petals with a candid base; ‘Beromunster’, maybe a “sport” of the previous one, where the white variegated zone, widens, pushing the red dot towards the apex; and the ‘Marchione of Bute’, created in England before 1940, with vinous shades and curled petals, with paler inferior surface, fluttering in a crazy cancan. The royal bear the cold better than the classical geraniums, but generally, require more attention. In summer, their large leaves disperse a lot of water, and, therefore, they are more sensitive to the thirst, and, in winter, seen that they cannot be kept dry too long time, they easily risk rottenness. The roots, which are thinner, require more attention in the transplantations; and, in order not to impair their large petals, it is better to avoid their exposition in places hit by the rain and the winds. Also their growth is different. Without a good amount of cold, the floral gemmae do not develop. This is well known by the nurserymen, who, after having grown the cuttings in warmed up greenhouses, with lowest temperatures of 15-16 °C, in January – February, they lower the temperature to 8-10 °C by night time, for 4-6 weeks, till when the first inflorescences do come out. A real experts’ work, not to talk of the use of dwarfing substances, like the CCC at the 0,2%, to get the head firm, and continuous treatments against the whitefly and the moulds caused by the fungi Botrytis. This must not, anyway, frighten the amateurs, who do not need to create, in record time, “super geraniums” in small pots to impress the client. With few plants the risks of diseases are modest, and, generally, the Mediterranean climates well adapt to the exigencies of the species. In Riviera and in the Côte d’Azur, it is not exceptional to find majestic specimen, close to the walls, which grow up practically by themselves; and on the terraces many varieties defy the years, the bad weather, and the saltiness, contenting themselves of a simple irrigating installation “drop by drop”. The mould, light, but nourishing, must be slightly acid (pH included between 5,5 and 6,5), with about the 10-20% of clay, or field earth, to increase its blotting power; and for a good flowering, it is better to use a fertilizer rich in potassium, of the type 1/0/2, or 1/1/2 NPK. It is very good, with a negligible expense, the one used in the cultivation of the tomatoes, and to prolong the spring flowering, with the emission of new gemmae, it is good practice to take off, at once, the withered flowers. He who loves to bring the small pots with himself, and lives by the seaside, with a holiday house up in the mountains, has then a second “chance”. After the first Mediterranean flowering, it is sufficient to prune lightly the plants, and transfer them to 700-1.000 metres of altitude. Here, in the coolness, after some weeks of rest, often the Royal Geraniums start again, vigorous, covering again of flowers without any problem. The cuttings are to be prepared with the usual techniques in August, choosing the branches which have not bloomed; and for an harmonious, bushy, gait, the small plants are to be polled at least twice. → To appreciate the biodiversity within the GERANIACEAE family please click here.